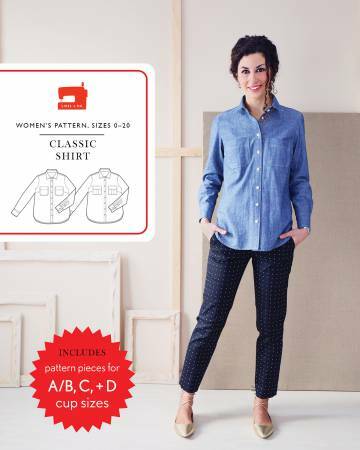 Patterns: Garments > Classic Shirt Pattern - Liesl & Co. Size 0-20. A wardrobe staple, this shirt is both versatile and polished. The pattern features separate pieces for A/B, C, and D cup sizes and includes many professional details like separate collar and collar band, tower sleeve placket, and collar and cuff facings to help you sew beautiful looking (and fitting!) shirts. View A includes a separate (set-in) placket and workshirt-style pockets. View B features a continuous (cut-on) placket and pleated pockets with concealed button flaps.